A company's earnings multiple is a key investment metric. 3. What Does It Mean When the Market Is Oversold? When investment analysts talk about a stock trading at X times earnings, they are making a comparison between the stock's market price and the issuing firm's profitability. The earnings multiple, also known as the P/E ratio (price/earnings), is perhaps the most frequently used benchmark for evaluating the prospects of a stock. 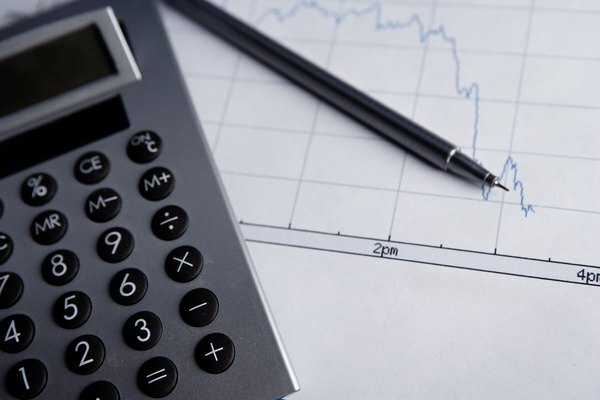 This ratio is calculated by dividing a stock's price by its earnings per share. So a stock that is trading at 20X earnings (having a P/E ratio of 20) is, for example, a stock that's trading at $40 per share divided by its earnings per common share of $2. Divide a stock's current trading price by its earnings per common share to find its P/E ratio; if the result is 20, the stock is trading at 20X earnings. Before you can calculate how many times earnings a stock trades at, you must first determine its earnings per share figure, or EPS. EPS equals a company's net income after taxes, minus preferred dividends, divided by the number of common shares outstanding. Assume that the firm earned $7 million during the most recent full year, and preferred stockholders are entitled to receive $1 million per year. Further assume that the firm has 3 million common shares outstanding. Subtract $1 million from $7 million for a total of $6 million. This is how much money is left with after paying preferred shareholders. By law, preferred stockholders must be paid before common shareholders can receive dividends. Dividing the resulting $6 million by 3 million common shares outstanding for earnings of $2 per common share. EPS data can be found in virtually all of the major stock indexes, which makes it easy to quickly evaluate this important data point. The terms "earnings multiple" and "Price to Earnings ratio," or PE ratio, mean the same thing. To calculate the earnings multiple, divide the stock price by the earnings per share. Suppose the common stock in the above example trades at $40 per share. The earnings multiple is $40 divided by $2, which equals 20. Such a stock would be said to trade at 20 times earnings, or 20 X earnings. Another way of expressing this concept is to say that the stock's PE ratio is 20. While the appropriate PE ratio for a stock depends on a number of factors, such as expected profit growth in the future, risks and so on, a figure of anywhere from 10 to 20 is reasonable. As of May 2018, the average PE ratio of all stocks in the S&P 500 index was 20.58. In similar fashion to EPS data, the PE ratio of stocks is commonly available online. If a stock trades at 20 times earnings, your share of the profits for each unit of common stock you own equals 1/20th of the stock's value. By taking the inverse of the earnings multiple and multiplying the result by 100, you can convert the multiple into a percentage yield. The inverse of 20 is one divided by 20, or 0.05. Multiplying this by 100 equals 5 percent, the percentage yield. When interpreting earnings, be careful to consider the inherent risks of stocks. A 5 percent yield from a stock investment is a very different proposition than a certificate of deposit (CD) that also yields 5 percent. While you are sure to receive the interest from a CD, stocks have an inherent degree of volatility that other investment vehicles do not. With that in mind, it would be somewhat shortsighted to consider short-term yield data a long-term predictor of gains or losses.